For other uses, see Midian (disambiguation). Midian (/ˈmɪdiən/; Hebrew: מִדְיָן‎), Madyan (Arabic: مَـدْيَـن‎‎), or Madiam (Greek: Μαδιάμ) is a geographical place and the Midianites a people mentioned in the Torah and Qur’an. Scholars generally consider it to have been located in the "northwest Arabian Peninsula, on the east shore of the Gulf of Aqaba on the Red Sea", and have long associated it with the region of Modiana reported in that same area by Ptolemy. According to Genesis, the Midianites were the descendants of Midian, who was a son of Abraham and his wife Keturah: "… again Abraham took a wife, and her name was Keturah. And she bare him Zimran, and Jokshan, and Medan, and Midian, and Ishbak, and Shuah" (Genesis 25:1–2, King James Version). The Midianites are also thought to be related to the Qenites (or Kenites), since the terms are used interchangeably in the Hebrew Bible. Moses' brother-in-law or father-in-law was a Qenite. 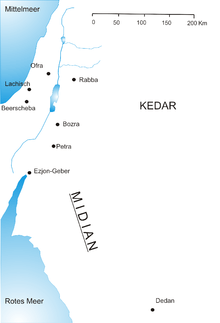 Some scholars have claimed that Midian was not a geographical area but a league of tribes. The Midianites through their apparent religio-political connection with the Moabites are thought to have worshipped a multitude of gods, including Baal-peor and the Queen of Heaven, Ashteroth. The Midianites may have worshiped Yahweh, the god whom according to the Bible Moses encountered at the burning bush at the far end of Midian's wilderness. It is uncertain, however, which deities the Midianites worshiped. An Egyptian temple of Hathor at Timna continued to be used during the Midianite occupation of the site (terminal Late Bronze Age / Early Iron Age); the Midianites transformed the Hathor mining temple into a desert tent-shrine. In addition to the discovery of post-holes, large quantities of red and yellow decayed cloth with beads woven into it, along with numerous copper rings/wire used to suspend the curtains, were found all along walls 1 and 3 of the shrine. Beno Rothenberg, the excavator of the site, suggested that the Midianites were making offerings to Hathor, especially since a large amount of Midianite votive vessels (25%) were discovered in the shrine. However, whether Hathor or some other deity was the object of devotion during this period is difficult to ascertain. A small bronze snake with gilded head was also discovered in the naos of the Timna mining shrine, along with a hoard of metal objects that included a small bronze figurine of a bearded male god, which according to Rothenberg was Midianite in origin. Michael Homan points out that the Midianite tent-shrine at Timna is one of the closest parallels to the biblical Tabernacle. Midianite pottery, also called Qurayyah Painted Ware (QPW), is found at numerous sites stretching from the southern Levant to NW Saudi Arabia, the Hejaz; Qurayyah in NW Saudi Arabia is thought to be its original location of manufacture. The pottery is bichrome / polychrome style and it dates as early as the 13th century B.C. ; its many geometric, human, and animal motifs are painted in browns and dark reds on a pinkish-tan slip. "Midianite" pottery is found in its largest quantities at metallurgical sites in the southern Levant, especially Timna. Because of the Mycenaean motifs on Midianite pottery, some scholars including George Mendenhall, Peter Parr, and Beno Rothenberg have suggested that the Midianites were originally Sea Peoples who migrated from the Aegean region and imposed themselves on a pre-existing Semitic stratum. The question of the origin of the Midianites still remains open. A Land or a League? Some scholars have suggested that 'Midian' does not refer to a geographical area or a specific tribe, but to a confederation or 'league' of tribes brought together as a collective worship purposes. Paul Haupt first made this suggestion in 1909, describing Midian as a 'cultic collective' (Kultgenossenschaft) or an 'amphictyony', meaning 'an association (Bund) of different tribes in the vicinity of a sanctuary'. Elath, on the northern tip of the Gulf of Aqaba was suggested as the location of the first shrine, with a second sanctuary located at Kadesh. Midian was where Moses spent forty years in voluntary exile after murdering an Egyptian. Moses married Zipporah the daughter of Jethro, the priest of Midian  (also known as Reuel). Cozbi, daughter of the Midianite chief Zur, was speared by Phinehas together with Zimri. Zimri was the son of a Simeonite chief, while Cozbi was a Midianite woman taken into his family by Zimri. The Midianite women's seductions of Israelites to their idol Baal-Peor (or Baal-phegor) is described as the cause of offense to God, even though the Midianites were racially akin to the Israelites as descendants of Abraham, and Moses' own wife Zipporah was Midianite. Ignoring this, at least one modern day movement has interpreted this story as a prohibition against miscegenation. Soon after, Yahweh instructed Moses to collect an army and destroy Midian. Some commentators, for example the Pulpit Commentary and Gill's Exposition of the Bible, have noted that God's command focused on attacking the Midianites and not the Moabites, and similarly Moses in Deuteronomy directed that the Israelites should not harass the Moabites. Moses condemned the Midianite women as the cause of the enmity between the Israelites and the Midianites, and ordered every woman who had slept with a man to be killed (Numbers 31:17), but 32,000 girls who have never slept with a man were kept as slaves (Book of Numbers 31:35). Israel was oppressed by Midian for seven years during the time of the Judges (Judges 6:1-6). Gideon was called by God to deliver Israel from Midian's armies (Judges 6:7-9). He killed the Midianite princes Oreb and Zeeb, then pursued their kings Zebah and Zalmunna as far as Karkor, slaying them as well. Hadad the Edomite, opposing King Soloman, passed through Midian and Paran while fleeing from Edom to Egypt. Isaiah (60:6) speaks of camels from Midian and Ephah coming to "cover your land," along with the gold and frankincense from Sheba. This passage, taken by the Gospel of Matthew as a foreshadowing of the Magi's gifts to the infant Jesus, has been incorporated into the Christmas liturgy. The people of Midian are mentioned extensively in the Arabic Qur’an. The word 'Madyan' appears 10 times in it. The people are also called "As-habul-Aykah" (Arabic: أصـحـابُ الأيـكـة‎‎, "Companions of the Wood"). Surah 9, verse 70 says "Has not the story reached them of those before them? - The people of Nuh (Noah), 'Ad, and Thamud, the people of Ibrahim (Abraham), the dwellers [literally, comrades] of Madyan (Midian) and the cities overthrown [i.e. the people to whom Lūt (Lot) preached], to them came their Messengers with clear proofs. So it was not Allah who wronged them, but they used to wrong themselves." ↑ Also Μαδιανίτης for "Midianite". ↑ Bromiley Geoffrey W. The International Standard Bible Encyclopedia. Wm. B. Eerdmans Publishing, 1996. ISBN 978-0-8028-3783-7. p. 350. ↑ Karel van der Toorn, Family Religion in Babylonia, Ugarit, and Israel: Continuity and Change in the Forms of Religious Life (Leiden: E. J. Brill), p. 283. ↑ Beno Rothenberg, Timna: Valley of the Biblical Copper Mines (London: Thames and Hudson, 1972). ↑ B. Rothenberg and J.Glass, "The Midianite Pottery," in Midian, Moab, and Edom: The History and Archaeology of the Late Bronze and Iron Age Jordan and North-West Arabia, JSOT Supplement Series 24, ed. John F.A. Sawyer and David J.A. Clines (Sheffield: JSOT Press, 1983), pp. 65–124. ↑ Tebes, "Pottery Makers and Premodern Exchange in the Fringes of Egypt: An Approximation to the Distribution of Iron Age Midianite Pottery," Buried History 43 (2007), pp. 11–26. ↑ Peter J. Parr, "Further Reflections on Late Second Millennium Settlement in North West Arabia," in Retrieving the Past: Essays on Archaeologial Research and Methodology, ed. J. D. Seger (Winona Lake: Eisenbrauns, 1996), pp. 213-218.